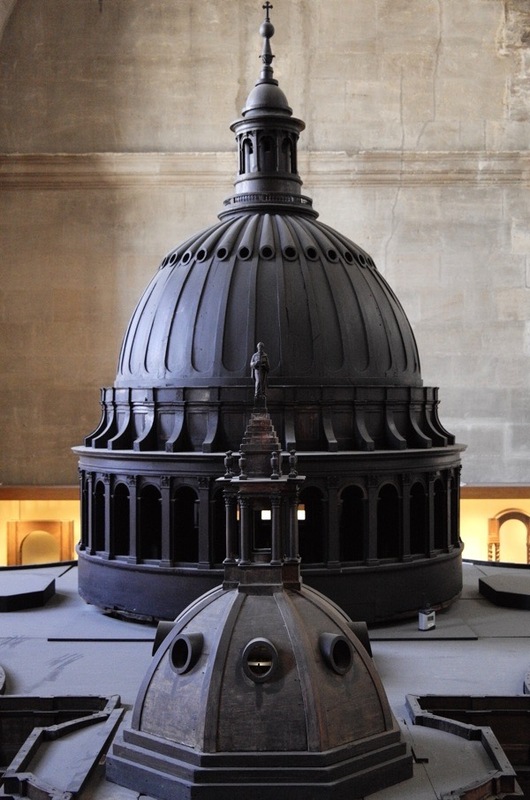 In a hidden chamber within the roof of St Paul’s sits Christopher Wren’s 1:25 model of the cathedral, looking for all the world like the largest jelly mould you ever saw. 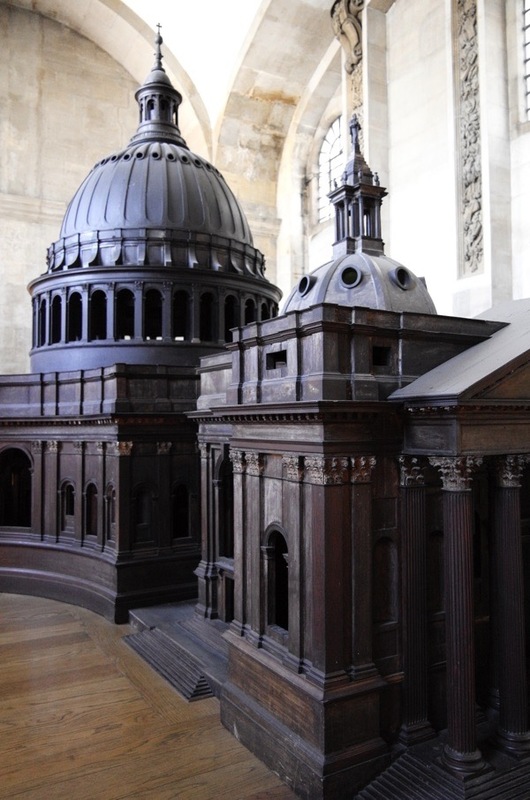 When Charles II examined it in the Chapter House of old St Paul’s, he was so captivated by Wren’s imagination as manifest in this visionary prototype that he awarded him the job of constructing the new cathedral. 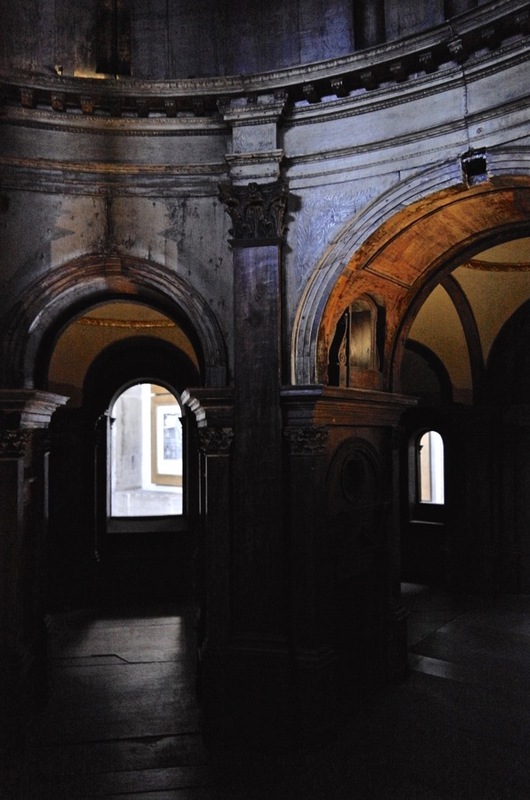 More than three hundred years later, Wren’s model still works its magic upon the spectator, as I discovered last week when I was granted the rare privilege of climbing inside to glimpse the view that held the King spellbound. 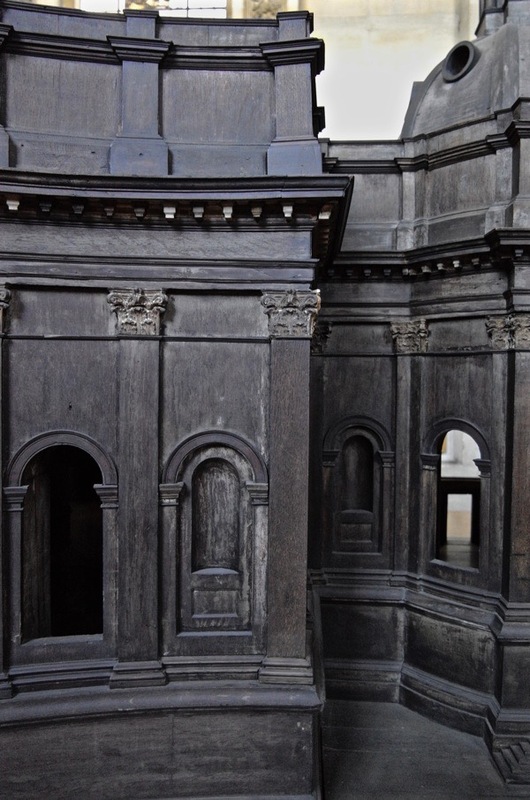 While there is an austere splendour to the exterior of the model, I discovered the interior contains a heart-stopping visual device which was surely the coup that persuaded Charles II of Wren’s genius. Yet when I entered the chamber in the triforium at St Paul’s to view the vast wooden model, I had no idea of the surprise that awaited me inside. Almost all the paint has gone from the exterior now, giving the dark wooden model the look of an absurdly-outsized piece of furniture but, originally, it was stone-coloured with a grey roof to represent the lead. 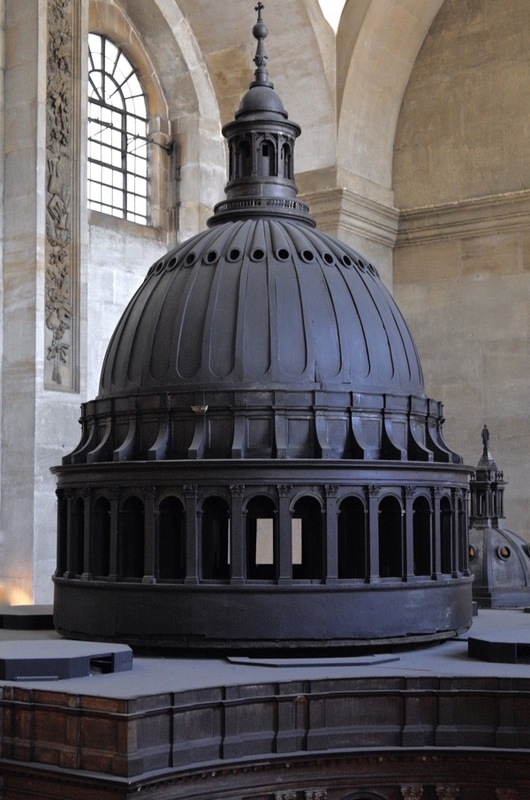 At once, you are aware of significant differences between this prototype and the cathedral that Wren built. 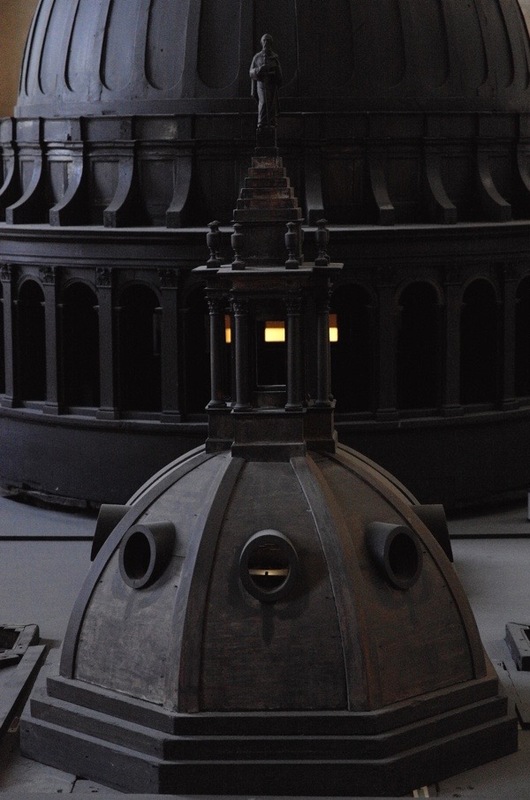 To put it bluntly, the model looks like a dog’s dinner of pieces of Roman architecture, with a vast portico stuck on the front of the dome of St Peter’s in the manner of those neo-Georgian porches on Barratt Houses. Imagine a fervent hobbyist chopping up models of relics of classical antiquity and rearranging them, and this is the result. It is unlikely that this design would even have stood up if it had been built, so fanciful is the conception. Yet the long process of designing a viable structure, once he had been given instruction by Charles II, permitted Wren to reconcile all the architectural elements into the satisfying whole that we know today. 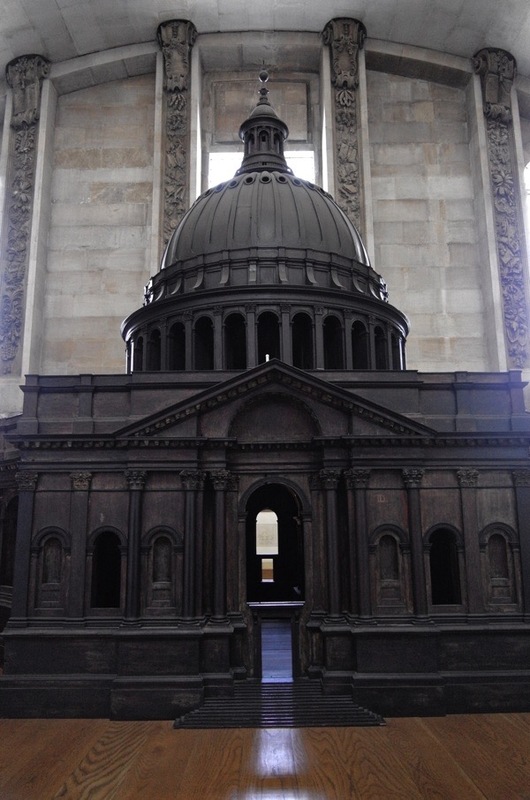 I had been tempted to visit the cathedral by an invitation to go inside the model but – studying it – I could not imagine how that could be possible. I could not see a way in. ‘Perhaps one end has hinges and Charles II crawled in on his hands and knees like a child entering a Wendy House?,‘ I was thinking, when Simon Carter, Keeper of Collections opened a door in the plinth and disappeared inside, gesturing me to follow. In blind faith, I dipped my head and walked inside. 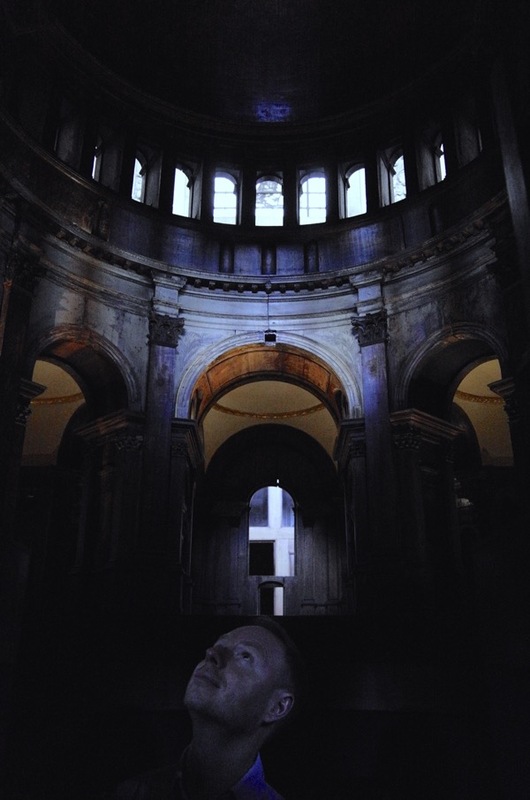 When I stood up, I was beneath the dome with the floor of the cathedral at my chest height. There was just room for two people to stand together and I imagined the unexpected moment of intimacy between the Monarch and his architect, yet I believe Wren was quietly confident because he had a trick up his sleeve. From the inside, the drama of the architecture is palpable, with intersecting spaces leading off in different directions, and – as your eyes accustom to the gloom – you grow aware of the myriad refractions of light within this intricately-imagined interior. Just as Wren directed Charles II, Simon Carter told me to walk to the far end of the model and sit on the bench placed there to bring my eye level down to the point of view of someone entering through the great west door. Then Simon left me there inside, just as I believe Wren left Charles II within the model, to appreciate the full effect. I have no doubt the King was thrilled by this immersive experience, which quickly takes on a convincing reality of its own once you are alone. Charles II discovered himself confronted by a glorious vision of the future in which he was responsible for the first and greatest classically-designed church in this country, with the largest dome ever built. Such is the nature of the consciousness-filling reverie induced by sitting inside the model that the outside world recedes entirely. 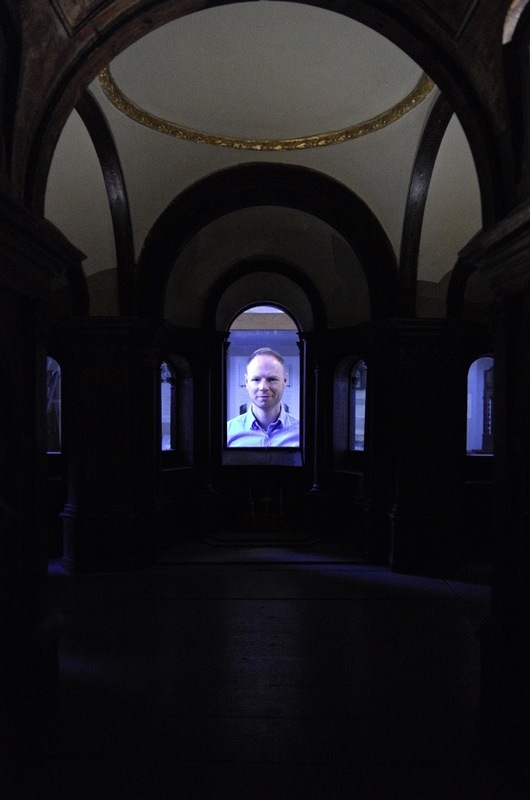 How astonishing, once you have accustomed to the scale of the model, when a giant face appears filling the east window. I could not resist a gasp of wonder when I saw it and neither – I suggest – could Charles II when Christopher Wren’s smiling face appeared, grinning at him from the opposite end of the nave, apparently enlarged to twenty-five times its human scale. In these unforgettable circumstances, the King could not avoid the realisation that Wren was a colossus among architects and – unquestionably – the man for the job of building the new St Paul’s Cathedral. The model had worked its spell. Behold, the largest jelly mould in the world! Wooden large scale models really show so much detail and provide such a sense of scale architects or Thierry patrons/ clients seem to have forgotten this basic tool of presentation ? 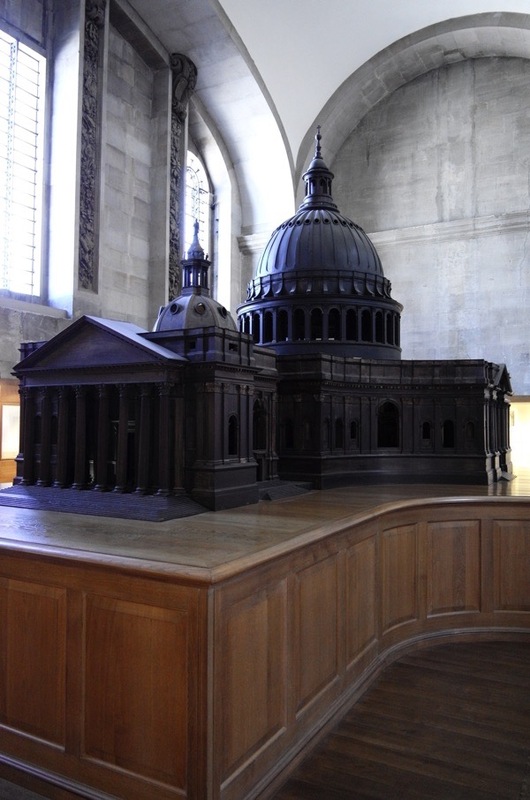 Thank you so much for sharing these pictures of the model of St Pauls; I had the privilege of seeing/touching it when I was eleven and am now almost 80. I was also able to go up to the actual bells. I understand should someone have rung the bells whilst one was that close it would destroy your hearing for ever. I have also been right to the summit i.e. into the actual cross on top of the orb, via a vertical ladder I seem to remember. It was possible to look out onto the city through a wire mess screen. I remember seeing the model at an exhibition at the RA, where thet used mirrors so you could see the interior. To go inside it must be amazing, I envy you the experience. 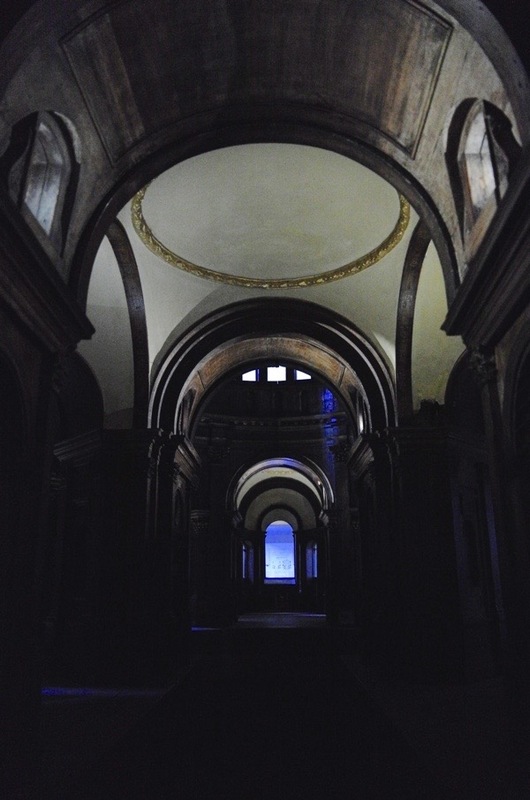 I remember at the exhibition that Wren would test ideas for the details of the interior of the cathedral with lifesize mock-ups to see how they looked before going ahead with construction. For those interested in architectural models I would recommend avisit tp Sir John Soane’s Museum in Lincolns Inn Field. 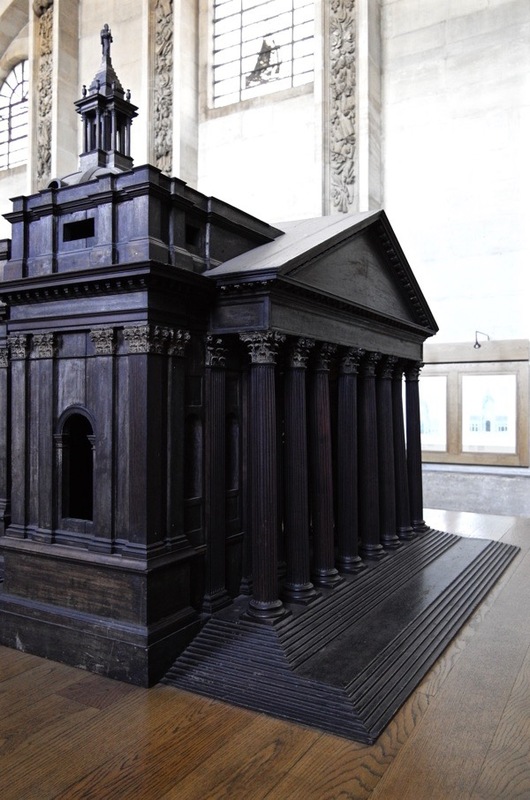 Soane was a believer in the use of scale models in the education of architects. As well as models of his own designs you can see the models he puchased ehen he visited France and Italy, some in plaster and some in cork. 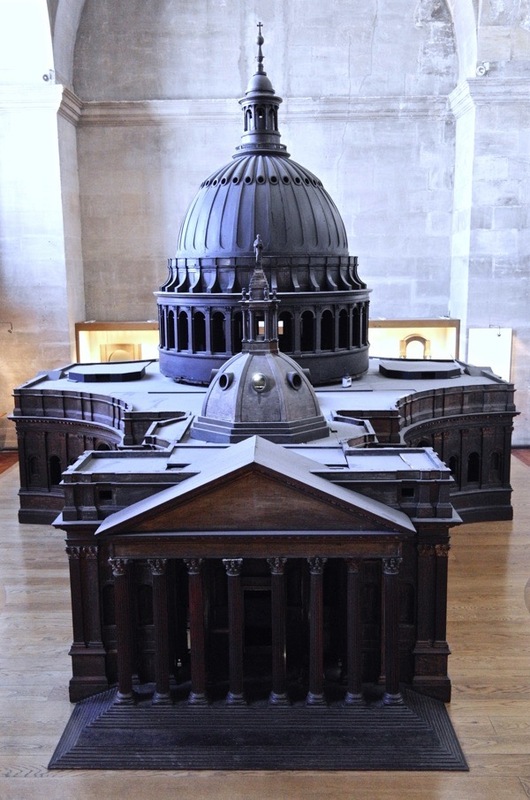 The Royal Academy Summer Exhibition has a room devoted to Architectural drawings and models but nothing on the scale of St Paul’s. Models are still used o enable clients to visualize a building in 3D and on a smaller scale how it will relate to its setting. Sir Christopher Wren was a childhood friend of the king. This vividly imagined intimate scene — of Charles II and Wren hiding together under a table — may have been a reenactment of games at Windsor. The king was already sold on the brilliant Wren. The spectacular model of what was understood to be a *preliminary* design supported fundraising and public relations, much as such models often do in our time. I recommend Lisa Jardine’s beautifully written illustrated biography On A Grander Scale: The Outstanding Life of Sir Christopher Wren. This is another fascinating insight into something which perhaps many of us have seen without realizing that it is possible to go inside as Charles II did, how lucky you have been GA to have that experience. Paul is quite right in his comment that you had to climb a vertical ladder to get up into the cross at the top of the Cathedral, I remember it well, and then, as you reached the top, you had to step over a space which was a drop right down to the floor goodness knows how far below. We obviously had to cross one at a time and there was someone there to hold your arm as you did so, very exciting and very memorable!! I imagine that the public are no longer allowed to climb that high for ‘health and safety’ reasons because if you had slipped there was nothing to stop you plummeting to the floor below, but I am so pleased that I have done it, the view from the top is incredible. I wonder at what point in the design process Wren constructed the model. His first design was for a cathedral that was effectively square. That idea was soon repulsed by the traditionalists who wanted a cathedral that was long, with a nave. So Wren had to compromise which may be the case here where he has tacked on an extension with a portico in order to try to mollify the traditionalists. Ultimately he had to design a proper nave and build the cathedral that we know today. Well, that’s the exact opposite of the case. I’m all for demolishing the current cathedral and building the Great Model instead, it’s a far better building. what a wonderful post about being inside the largest jelly mould in the world. Loved all the surprises including the piece de resistance at the end. Thanks for including us in.